FUTURE CAMPUS STUDIO is a collection of 12 projects imagining prospective visions for the University of Michigan’s North Campus. As a site distinct from Central Campus and Downtown Ann Arbor, North Campus becomes an ideal test-bed for innovative forms of university campus urbanism, exploring the potential for emerging technologies to influence new forms, configurations, and occupancies of campus buildings, housing, infrastructure, and collective open space. In order to maintain and increase the University’s standing in the global academic landscape, the North Campus community must leverage its strengths to form a greater vision of the leadership and diversity of world-class “research, living and learning” possible here. The projects in the exhibition have been developed over the 2018 Winter Semester by Master of Architecture and Urban Design students at the Taubman College of Architecture and Urban Planning, and are intended to spark interest and conversation with the wider community as to next steps towards building an unprecedented future for North Campus. 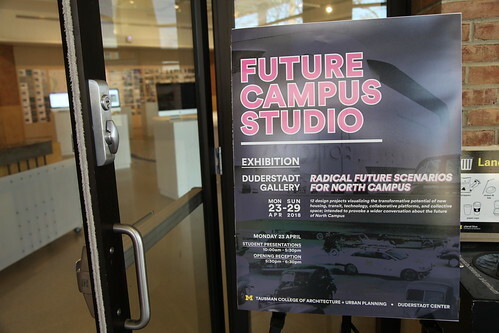 Future Campus Studio will be on view in the Duderstadt Gallery from April 23 - July 27, 2018. Gallery hours are 12:00pm - 6:00pm, Monday - Friday.